BooksVago, Steven (5th ed. 2003), Social Change, Upper Saddle River, NJ: Pearson Prentice Hall. BooksWankel, Charles (ed.) 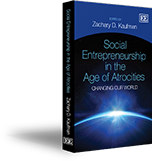 (2008), Alleviating Poverty through Business Strategy, New York, NY: Palgrave Macmillan. BooksWei-Sillern, Jane, James E. Austin, Herman Leonard, and Howard Stevenson (2007), Entrepreneurship in the Social Sector, Thousand Oaks, CA: Sage Publications, Inc.